* Also included rubber gasket for receiver (fits between receiver plate and bowl deck) * Dimension of Receiver 3-1/4" x 2-3/4"
* Color: Chrome Note: This Hose Receiver has a Embedded Metal Nut to fasten the bolt into the receiver plate when mounting it to the shampoo bowl. This makes it much STRONGER than the cheaper receiver plates on the market today, their bolt just screws directly into the plastic receiver plate, which strips out of the receiver plate, thus NOT holding the receiver plate in place. A loose Hose Receiver Plate will allow it to move and then water will leak underneath the bowl! 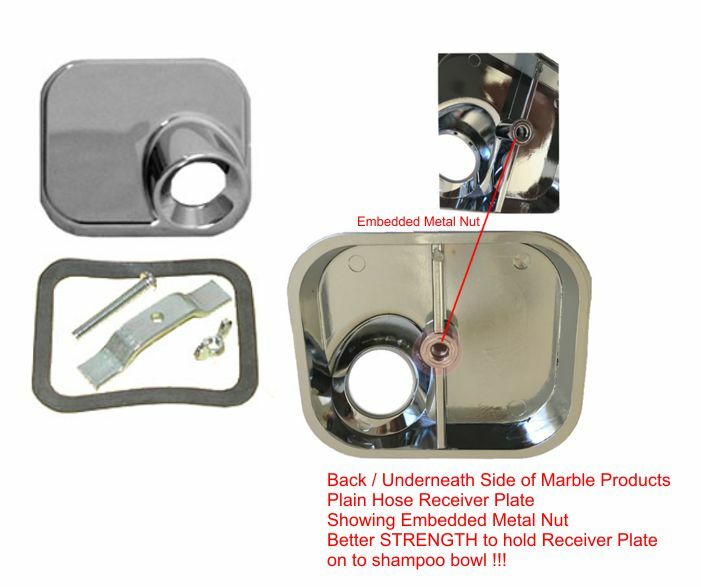 The embedded Metal Nut allows the Marble Products brand Hose Receiver Plate to stay put when pulling the shampoo hose in and out of the receiver plate !!! Cost a little more but you are "cutting hair" and makeing money instead of wasting time repairing your equipment !